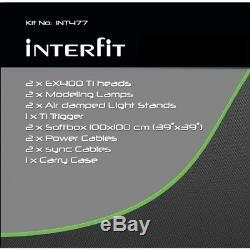 Interfit EX400 Ti Flash kit - INT475. The EX400 is the latest generation in the multiple award winning EX range, utilising a unique radio control system the heads have up to seven individual IDs programmed by the user. This allows each head to be controlled from the camera position without having to go to the EX400 Ti unit to make adjustments, all the main functions such as modelling light, flash power etc. Each head has the ability to assign an ID number 1 through to 7, this allows the Dynamic Trigger to be able to adjust the features of each head separately from any of the other EX Ti heads being used in the same room up to 12 meters away from the trigger. If you assigned a head to channel 1 and another head to channel 2 you can individually adjust each head's power functions and fire the head via the Dynamic Ti Trigger by setting its corresponding channel number on the trigger. When used with the Sync cells turned off, complete control is offered via radio signals only. Once you have set up the controls and the lighting the way you want them to operate, simply press the top left button on the Dynamic Ti Trigger through to channel 8, this allows all heads to fire in sync. Should you have more than one head set on a single channel you can adjust and fire them in sync via the Dynamic Ti Trigger. 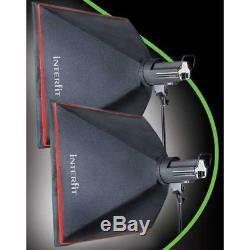 Available as a Single Head or as a Twin Softbox kit, the EX Ti 400 is an ideal product for every generation of photographer. The item "Interfit EX400 TI Studio light Kit" is in sale since Wednesday, October 31, 2018. This item is in the category "Cameras & Photography\Lighting & Studio\Flash Lighting\Flash Lighting Kits". The seller is "moneyhub" and is located in hamilton.